I am just in the process of planning new classes for the autumn and for Spring 2013. 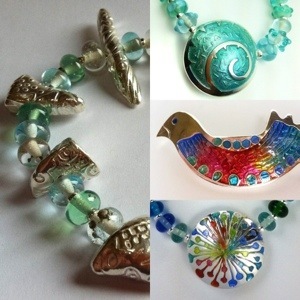 I will be inviting some guest tutors to run classes here in my beautiful studio in North Yorkshire and classes will include jewellery making, learning to enamel, enamelling silver jewellery, bead making and art clay silver, metal clay or PMC. A two day workshop. On the first day you will design and make a silver pendant, learning about design for enamel. On the second day you will prepare and apply wire patterns followed by thin layers of enamel, firing each layer in turn. You will then learn methods for finishing the piece to a high standard. The course includes small amounts of enamel, enough to complete the project. Other dates by arrangement. Booking essential. Dates book up quite quickly so please get in contact if you are wanting a place. Art Clay Level 1 certification – Dates by arrangement and price on application – subject to the prices of kits required to make the projects chosen. This is a four day course following the syllabus set by the Aida Corporation (manufacturers of Art Clay Silver). Seven projects are made over the four day period, including rings, earrings, pendants and a brooch. The course fee includes the materials to make the seven projects and the use of tools and equipment. The projects are assessed and if completed successfully an application for the certificate will be made to the Art Clay UK Guild. If any of the projects are unsuccessful then arrangements can be made to ‘remake’ them at additional cost to the student. Terms and conditions 50% deposit required to confirm a place, balance payable by cheque or cash 7 days prior to the first day of the class. 7 days notice of cancellation is required so that I can resell the workshop place. In the event of cancellation more than 7 days before the class the deposit can be carried over to another mutually convenient date. Each class has a maximum number of places available and a minimum number before it can run. If I have to cancel a workshop I will give as much notice as possible and a place will be offered for an alternative workshop at a future date. Refunds will be given in the event of tutor illness or insufficient numbers booked for a workshop. I reserve the rights to vary these terms and conditions at any time. The studio is based in the beautiful village of Glaisdale approximately 12 miles from Whitby on the North Yorkshire Moors. My studio is based in the beautiful village of Glaisdale on the North Yorkshire Moors, approximately 12 miles inland from Whitby. I can recommend B&B accommodation locally if you wish to take two or more classes or extend your stay and enjoy the area.